At SMO Energy, we’re a leader in propane and heating oil delivery for St. Mary’s County. By offering competitive and transparent prices, knowledgeable technicians and exceptional service, we’ve set ourselves apart from other propane companies in St. Mary’s County. As-needed, scheduled or automatic delivery: Have your heating fuel delivery on your terms with our delivery options. Select our free automatic delivery to avoid checking your fuel tank throughout the year or plan your fuel deliveries. As-needed deliveries can be scheduled by phone or online. Customized payment plans: Our propane heating prices in St. Mary’s County become even more competitive with our tailored payment plans. Through our free SmartPay Budget Plan, we provide you with a low payment each month by estimating your annual fuel usage. Multi-purpose online portal account: With your free online portal account, you can manage your payments, deliveries, service requests and more without even leaving your home or picking up the phone. If you do have questions, you can always call our experienced representatives. All-day and year-round emergency service: When your heating system fails, you don’t have to wait until Monday. Our team is always available and ready to take your call seven days a week, 24 hours a day and 365 days a year. Consultations: Find the best high-quality tank for your home with our consultation and recommendation services. With our team’s expertise, we’ll present you with the best propane tanks for your home and energy needs. We’ll also connect your newest and existing propane appliances. Conversions: Our available conversion options make it a simple process to transfer to propane from heating oil. Propane is more cost-effective compared to heating oil prices in St. Mary’s County. It’s also cleaner and more efficient than heating oil and comes with a credit of up to $1,000. Installations: Whether you’ve purchased a new propane tank or chosen to lease one from us, you can count on our propane specialists to install your container to the highest safety standards and regulations. We make sure your tank is the appropriate size and installed using permits and the rules set by the American Society of Mechanical Engineers (ASME). For more than 90 years, SMO Energy has provided communities across Maryland, including St. Mary’s County, with exceptional services, high-quality heating fuel and outstanding technicians, representatives, and specialists. As a full-service, family-owned business, people across the region trust us for all their home comfort needs. 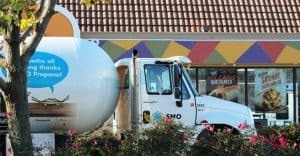 Choose SMO Energy for your energy demands by requesting a free quote today for propane heating prices in St. Mary’s County.